Joan Ann Olivier, Baroness Olivier, DBE (née Plowright; born 28 October 1929), commonly known as Dame Joan Plowright, is a retired English actress whose career has spanned over six decades. She has won two Golden Globe Awards and a Tony Award and has been nominated for an Academy Award, an Emmy and two BAFTA Awards. She is also one of only four actresses to have won two Golden Globes in the same year. Plowright was born in Brigg, Lincolnshire, the daughter of Daisy Margaret (née Burton) and William Ernest Plowright, who was a journalist and newspaper editor. She attended Scunthorpe Grammar School and trained at the Bristol Old Vic Theatre School in London. Plowright made her stage debut at Croydon in 1948 and her London debut in 1954. In 1956 she joined the English Stage Company at the Royal Court Theatre and was cast as Margery Pinchwife in The Country Wife. She appeared with George Devine in the Eugène Ionesco play, The Chairs, Shaw's Major Barbara and Saint Joan. In 1957, she co-starred with Sir Laurence Olivier in the original London production of John Osborne's The Entertainer, taking over the role of Jean Rice from Dorothy Tutin when the play transferred from the Royal Court to the Palace Theatre. She continued to appear on stage and in films such as The Entertainer (1960). In 1961, she received a Tony Award for her role in A Taste of Honey on Broadway. Through her marriage to Laurence Olivier, she became closely associated with his work at the National Theatre from 1963 onwards. In the 1990s she began to appear more regularly in films, including Enchanted April (1992), for which she won a Golden Globe Award and an Academy Award nomination, Dennis the Menace (1993), a cameo in Last Action Hero (also 1993) and Tea With Mussolini (1999). She was also the Nanny in 101 Dalmatians (1996). Among her television roles, she won another Golden Globe Award and earned an Emmy Award nomination for the HBO film Stalin in 1992 as the Soviet dictator's mother-in-law. In 1994, she was awarded the Women in Film Crystal Award. In 2003, Plowright performed in the stage production Absolutely! (Perhaps) in London. She was appointed honorary president of the English Stage Company in March 2009, succeeding John Mortimer, who died in January 2009. She was previously vice-president of the company. Plowright was appointed a Commander of the Order of the British Empire (CBE) in the 1970 New Year Honours and was promoted to Dame Commander (DBE) in the 2004 New Year Honours. Plowright's eyesight declined steadily during the late 2000s and early 2010s due to macular degeneration. In 2014, she officially announced her retirement from acting because she had become completely blind. Plowright was first married to Roger Gage, an actor, in September 1953. She divorced him and, in 1961, married Laurence Olivier after the ending of his 20-year marriage with the actress Vivien Leigh. The couple had three children, Hon. Richard Kerr Olivier (born December 1961), Hon. Tamsin Agnes Margaret Olivier (born January 1963) and Hon. Julie-Kate Olivier (born July 1966). Both daughters are actresses. The couple remained married until Lord Olivier's death in 1989. Her brother, David Plowright (1930–2006), was an executive at Granada Television. The Plowright Theatre in Scunthorpe is named in Plowright's honour. Upon her marriage to Sir Laurence Olivier, her formal title became Lady Olivier; however, she never used it in her professional career. Her husband was made a life peer in 1970 and so she became Baroness Olivier. Professionally, she is known as Dame Joan Plowright. As of 2004 her full and official title, as the widow of a peer and Dame Commander of the Order of the British Empire, is The Right Honourable The Baroness Olivier DBE. 1954 Sunday Night Theatre Adriana Episode: "The Comedy of Errors"
1957 Sword of Freedom Lisa Giocondo Episode: "The Woman in the Picture"
1970 ITV Playhouse Lisa Episode: "The Plastic People"
All for Love Edith Episode: "A Dedicated Man"
1983 Wagner Mrs. Taylor Episode: "1.2"
1987 Theatre Night Meg Bowles Episode: "The Birthday Party"
Screen Two Mrs. Monro Episode: "The Clothes in the Wardrobe"
^ Herbert Kretzmer (28 August 2014). Snapshots: Encounters with Twentieth-Century Legends. ISBN 9781849547987. Retrieved 31 March 2016. 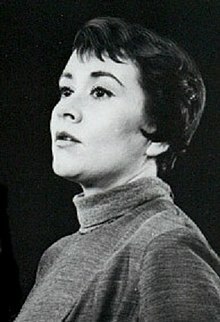 ^ "Joan Plowright Biography". Yahoo! Movies. Retrieved 29 June 2007. 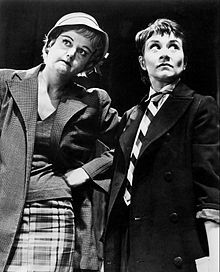 ^ "Joan Plowright Biography (1929-)". ^ MacKay, Andrew (23 April 2010). "Joan Plowright - interview transcript" (PDF). The British Library. ^ "Entertainment | Plowright steals the limelight". BBC News. 31 December 2003. Retrieved 12 June 2012. ^ "Past Recipients: Crystal Award". Women In Film. Archived from the original on 30 June 2011. Retrieved 10 May 2011. ^ Smith, Alistair (5 March 2009). "Plowright becomes honorary president of English Stage Company". The Stage. The Stage Newspaper Limited. Retrieved 12 March 2009. ^ "Viewing Page 9 of Issue 44999". London-gazette.co.uk. 30 December 1969. Retrieved 12 June 2012. ^ "Viewing Page 7 of Issue 57155". London-gazette.co.uk. 31 December 2003. Retrieved 12 June 2012. ^ Walker, Tim (13 May 2014). "Joan Plowright bows out to a standing ovation". Telegraph. Retrieved 31 March 2016. ^ "Joan Plowright Biography". Film Reference. Retrieved 29 June 2007.